Messier 17, NGC 6618, the Swan or Omega Nebula is a region of star formation located in Sagittarius. Astrophotographers Bob and Janice Fera took this photo June 3 to 4, 2013 from Eagle Ridge Observatory in Foresthill, Calif. The Swan Nebula shines in this beautiful night sky image captured by a team of veteran astronomy photographers. Astrophotographers Bob and Janice Fera took this image of the Swan Nebula between June 3 and 4, from Eagle Ridge Observatory in Foresthill, Calif. 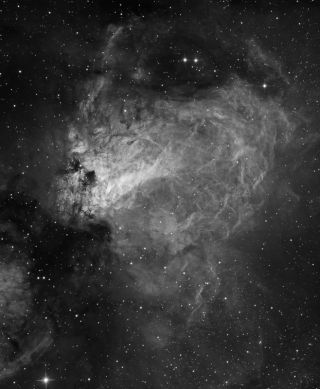 The Feras used an Officina Stellare RC-360AST 14" f/8 Ritchey Chretien Cassegrain telescope with a two-element field flattener to observe the nebula. An Apogee Alta U16M CCD camera with Astrodon filters was used to capture the photo. Messier 17, NGC 6618, the Swan or Omega Nebula is a region of star formation located between 5,000 and 6,000 light-years from Earth away in Sagittarius. The emission nebula glows from the high-energy radiation of bright, young stars deep within the core. The nebula has many names because it’s said to resemble a swan when inverted, a Greek omega letter and even a horseshoe.